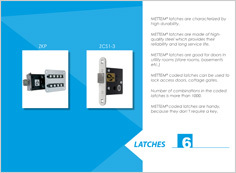 METTEM® code latch can be used to lock access doors, cottage gates. The number of combinations in the code latches is more than 1000. METTEM® coded latches are handy, because they don’t require a key.